Happy Halloween!!!! Law School is getting real folks. Want to know what sacred me today? I had my first midterm this afternoon. I realize this is a lot later than most schools but my teacher pushed it back a whole week to ensure we covered the last chunk of material. My exam was over Estates and Future Interests of Property Law. According to my professor, this is the hardest material we will cover all of 1L year... I am pretty sure I believe him. That stuff was hard. This morning I woke up at 6am, drank 3 cups of coffee right away and studied until my classes started at 1pm. I walked into that classroom exhausted, scared to death but also as ready as I was going to get. Thankfully, I am now done with midterms (I only had the one) and I have a few thoughts on the subject as a whole. I studied harder for this 30 question midterm than I have in my entire life; this did not come easily like things did in High School and Undergrad. I have been making notecards, reviewing nightly, going to my professor's office hours and attending study groups for the last 2.5 weeks in preparation. I spent my entire weekend studying, doing practice questions, practice quizzes online and reviewing my notes until I had the paper nearly memorized. It was a whirlwind and it consumed my life... but I think it was worth it. The more I studied, the more things clicked together and became second nature. It has been really hard but here's hoping it pays off in my grade. I found it challenging to balance preparation for this midterm with my other classes. My outlining fell behind, I procrastinated big time on my final memo outline (due tomorrow!) and I was not doing the weekly practice questions for contracts like I had been earlier in the semester. In the future, I would like to find a better balance to juggle studying hard for midterms without falling behind on everything else and letting it consume my life. The test was fairly general and similar to past tests. We completed the first half on a scantron as they were multiple choice and the second half were short answer. One thing that was different was using an exam number; in my undergrad, we simply put our name on everything. I am not one to have much test anxiety and usually, I finish quickly and without many issues. This test gave me 3x the anxiety of anything else (except for maybe the LSAT) simply because it was my first Law School exam ever. I didn't know what to expect and though I had prepared to the best of my ability, I still felt like it may not be enough. Thankfully once I opened the booklet and settled into the testing process, I relaxed because I felt confident in my answers and what I was doing. I let the test feeling relieved that it was over and happy that I felt I had turned in a very respectable effort. We shall see what happens in grading and with the curve! Law School midterms are a bit of a beast. It happened to fall right with the final memo assignment beginning, hard material in my other classes and some events in my personal life. Not great timing but I am proud of myself for pushing through and making sure I put in a respectable effort. Also, I had no idea what to expect and that scared the crap out of me. It gave me the worst test anxiety ever, second only, (maybe!) to the LSAT. But at least the LSAT could be retaken if necessary! 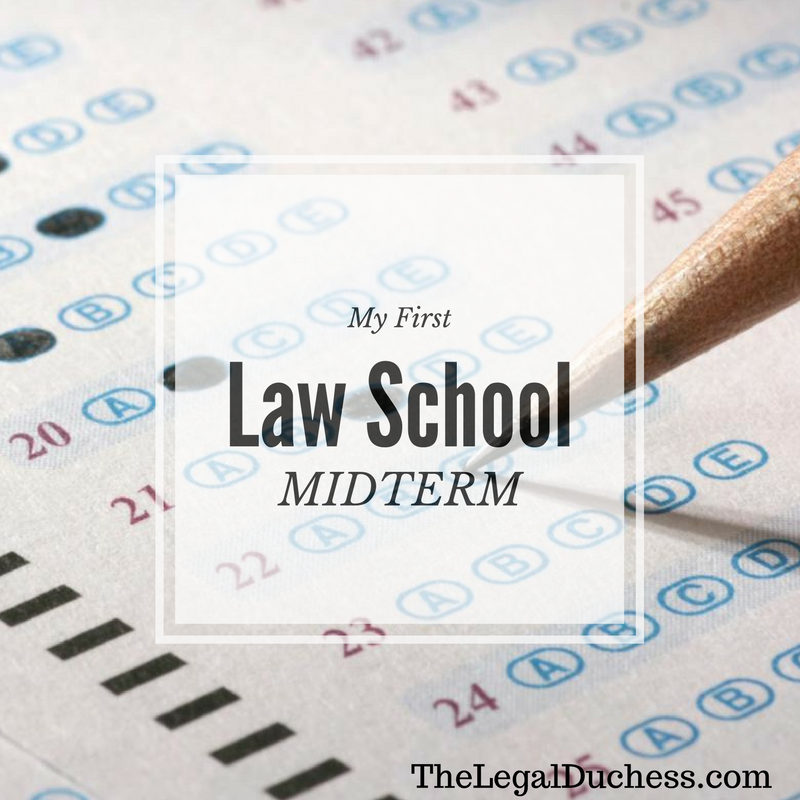 No such luck with Law School midterms. I am glad it is over and now the anticipatory waiting begins as the exams are graded (which is almost as bad). It is out of my hands now and I can only hope I get a grade that reflects well on the effort I put into it and the knowledge I gained. Up next, real Law School exams.... I am definitely not ready for that! Who needs Halloween when you have that to scare the bejesus out of you?